Whilst some balked at the passing of development duties from Naughty Dog to Bend Studio for Uncharted’s handheld debut, those with long memories knew this was no great cause for concern. Responsible for a rip-roaring Syphon Filter trilogy on the original PlayStation, the studio formerly known as Eidetic went on to devise the superlative Dark Mirror, a covert shooter that had no right working as well as it did on a PSP. And whilst Golden Abyss isn’t thematically groundbreaking, it effortlessly transports one of the PS3’s most cutting-edge properties unhindered onto the Vita. Everything has transitioned so effortlessly, it’s easy to take for granted a game that, only a couple of years earlier, we could barely have imagined running on a portable platform. Golden Abyss is a great game, and all the more impressive as it was ready at the system’s launch; a period typically associated with safe visual design and a myriad of technical teething issues associated with developing on new hardware. 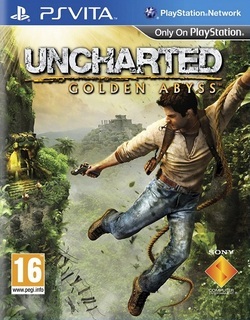 But there’s none of that here, as Golden Abyss neatly and confidently distils the spirit of Uncharted into a convincing small-screen experience, along with all of the series’ traditional quirks, strengths and occasional weaknesses. 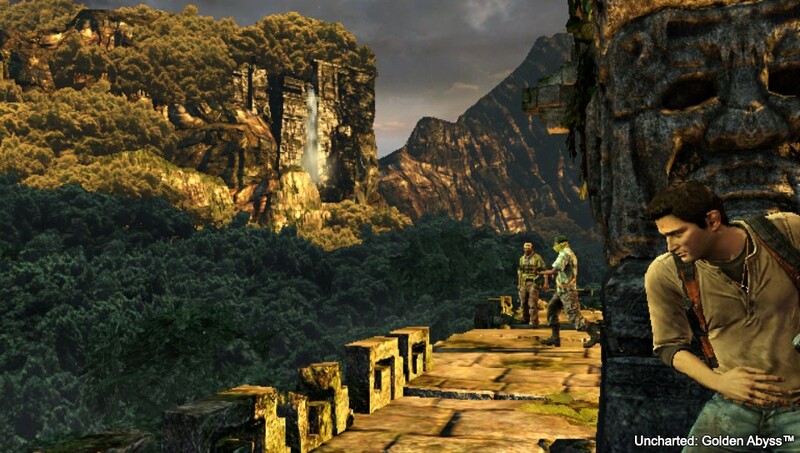 As is to be expected, Nathan Drake’s back and in fine, wise-cracking form, as he embarks on another epic treasure hunt through the jungles and temples of Panama. It’s a hotbed of guerilla fighters, tin-pot Dictators, mysterious love interests, cinematic set-pieces, jaw-dropping architecture and destruction on a blockbuster scale. In short, it’s a déjà vu we’re more than happy to revisit. The shooting and platforming will be instantly familiar to Uncharted aficionados. 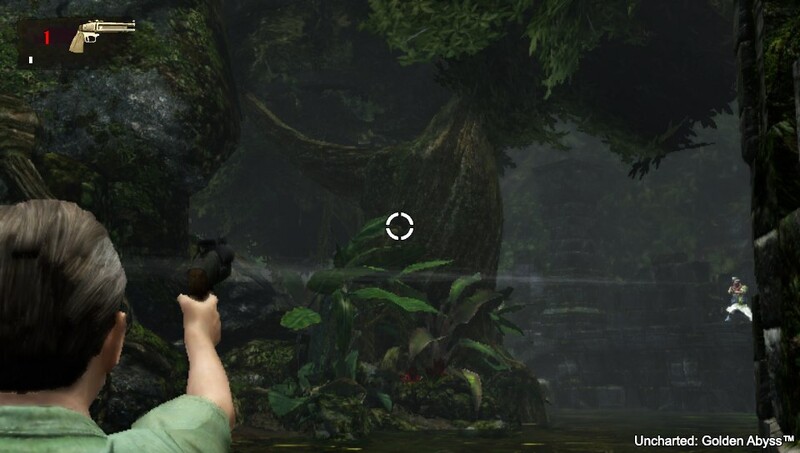 The dense jungle surrounds and single-player focus aligns it closely with the original PS3 adventure Drake’s Fortune, and just like its big-screen brother, the fire-fights are fraught and satisfying. Granted, aiming remains a little clunky; the reticle is a shade too heavy on initial movement and a little too light once you’ve got it going, though the cover system remains highly intuitive and the guns are a lot of fun to use, as varied characteristics beget the need to adapt as you carry different weapons. 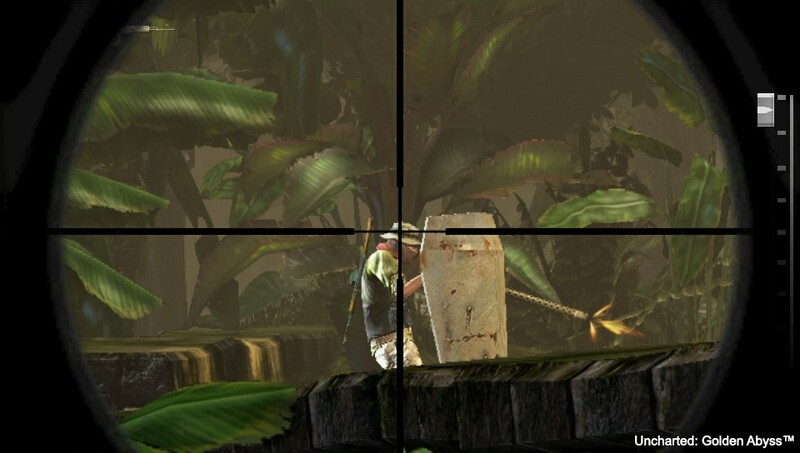 Using the Vita’s giro to aim the sniper sights is a surprisingly neat feature, whilst lobbing grenades via a drag of the touch-screen is way more fun than it’s been given credit for. The only element of combat diminished by the touch functions is reloading, a cumbersome, unreliable method that gets tiresome quickly. On the whole though, it’s surprising just how well the Vita-specific functions do come off, perhaps because they’re used for imaginative supplementary purposes. There’s a raft of exploration-specific ideas, the best of which involves using the Vita as a camera. With the back touch-pad adjusting zoom, aiming the console as if it was the lens is genuinely cool, acting as a window into an inviting, beautiful world replete with grand facades. The touch-screen is put to further good use for puzzles and charcoal rubbings, whilst perhaps the biggest surprise sees you shining a bright light at the back of the console, revealing a message hidden on parchment. Each works well and without any blips, and it’s nice to see Bend Studio have thought of appropriate ways in which to implement these little extras. One thing you can bank on with Uncharted, it’s going to look a peach. Indeed, save for a slight reduction in character detail and the odd, very occasional jaggy, there’s almost nothing here that would break the illusion you were playing a PlayStation 3 game. Indeed, there are certain elements of the visual design that if anything prove superior to its forebears – the incredible water and lighting effects in the startlingly pretty (even by Uncharted’s standards) Lake of Ghosts are a great example. Close detail is intricate and attractive, whilst the bigger views and show-stealing design ensure one of the most lavishly presented portable adventures there’s ever been. Cut-scenes are bright and dynamic, action is unerringly smooth, the A.I. characteristically devious. In short, it looks and runs like an Uncharted game should. The developer has stuck rigidly to the spirit and structure of Naughty Dog’s blueprint. This of course means for spectacular presentation, action movie music, sparky and fun dialogues and death-defying leaps galore, though it would have been nice if they’d been allowed off the leash a little to demonstrate a little more of their vision. Bend’s most significant contribution revolves around some excellent stealth sections, particularly useful on Crushing difficulty for taking out foes without having to risk being outnumbered in a firefight. These are satisfyingly direct instances as you work your way, guard to guard, taking them out silently. Perhaps the game’s biggest success is in evoking the feeling that you’re involved in a console-quality experience without the player ever really being conscious of compromise. You’ll soon adapt to the miniature twin-analog sticks, with the platforming and combat portions soon feeling second-nature, even if Nate does still occasionally plunge to his doom after forgetting to grab a ledge, or ruin a tough firefight by hugging the wrong bit of cover. Bend Studio have put the Vita’s diverse functionality to impressive initial use, and in such a manner that doesn’t detract from the core gameplay. How long does it last? High production levels fortunately aren’t at the expense of length, as Golden Abyss offers a surprisingly meat story of thirty-odd pint-sized chapters, as it makes a credible attempt to mix up the tempo and activities. Experienced gamers will look to the Crushing difficulty that becomes available after you’ve beaten the game on Hard, and this packs a modest punch, one that will tax newcomers even if it’s unlikely to strain those familiar with Drake’s universe. Many will feel the touch-screen/QTE boss battles are a bit of a let-down (though admittedly, bosses are an area in which Uncharted has always struggled to find a happy medium), but on the whole, there’s enough to keep you exploring for a good few weeks. 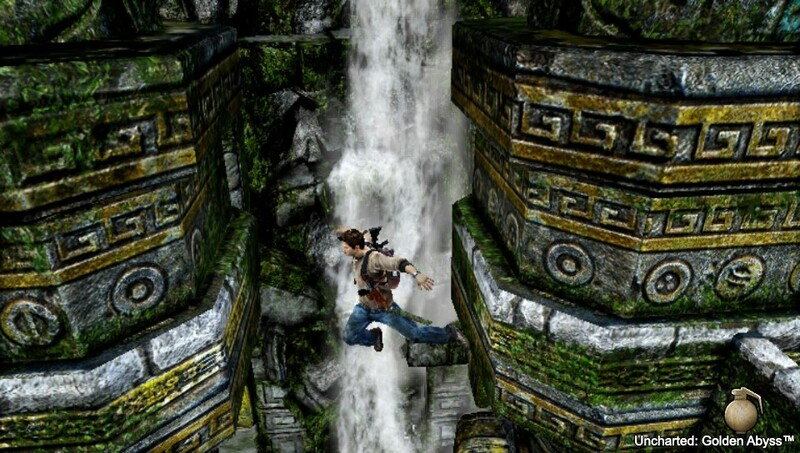 Uncharted: Golden Abyss may not reinvent the gaming landscape – there are bigger bangs available in higher resolutions of course – but it’s likely an action/adventure that will age with some considerable grace. With a fail-safe mix of stunning visual design and assured gameplay, Bend Studio have added to a successful formula with a raft of smartly-implemented hardware functions that build a distinctive, quality experience. So whilst it takes after its Uncharted bigger brothers, Golden Abyss also feels like it belongs on the handheld, and for a Vita owner on launch day, you couldn’t really ask for more than that.